MindFusion Xamarin Chart has been released with the complete set of features needed to create and customize a wide selection of charts. The control boasts a variety of chart types like radar, polar, line, bubble, bar, column, doughnut, step, scatter etc. Part of the library are also a dashboard component and a component for financial charts. Each chart type exposes numerous options to be customized in order to answer fully the requirements of the user. The control is packed with many samples that demonstrate different aspects of a chart type and offer ready-to-use code. The API is documented in details, with helpful tutorials and guides. The chart component supports flexible data interface, which allows any data source to be used as a provider of chart data as long as it implements the Series interface. Predefined are a set of the most common data sources like XML, numeric lists, DateTime values, SQL database fields. The innovative approach to styling lets developers control each aspect of the chart’s looks. They can alter the styling on the tiniest elements or concentrate on the bigger picture and create a global theme which can be reused. About MindFusion: MindFusion has provided quality software tools for thousands of organizations and individuals for over a decade. With focus on lean software design and excellent technical support, MindFusion has been preferred by many Fortune 500 companies and world-known names from all industries and fields of business. MindFusion programming components are easy to use, with plenty of options to be customized and make development much faster and successful. MapNodes can render street maps in OpenStreetMap format. Call FromXml method of MapContent to load an .osm file. The pens and brushes used for drawing the map are stored within the StreetMapPens and StreetMapBrushes collections in the static StreetMapFeatures class. You can define additional pens and brushes for drawing and painting certain map features by using MapContent’s AddPen and AddBrush methods. Support for FromPage and ToPage properties of PrinterSettings. Fix for not restoring ColumnStyle value when cancelling or undoing TableNode column resize operations. Your comments and feedback about the new version is welcomed. You can use the Diagramming for WinForms forum, the help desk or write us at support@mindfusion.eu. Our support team will be pleased to help you. Columns and rows of a TableNode can now be resized interactively if its AllowResizeColumns or AllowResizeRows properties are enabled. In order to resize, move the mouse pointer to the border line on column’s right side or row’s bottom side until it shows resize cursor and start dragging. The control raises TableColumnResizing and TableRowResizing events to let you validate new size or prevent resizing some elements. The TableColumnResized and TableRowResized events are raised after the operation completes. NodeConstraints.KeepInsideDiagram prevents a node from leaving diagram boundaries during user interaction (the older RestrictItemsToBounds property does not stop nodes from leaving diagram area but returns them to original position if dropped outside). dashed selection frames are now drawn in two colors and should be visible on both the default white background and custom darker backgrounds. You can change the second dash color via HandlesVisualStyle.DashBackground property. 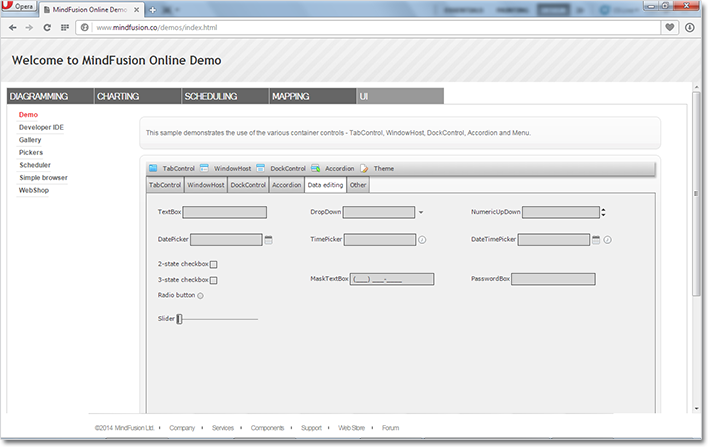 custom connection point classes can now override ConnectionPoint.NearestAnchorPoint to implement custom anchor point selection logic; the method is now also called at the beginning of interactive link creation. SvgNode supports SVG images with vector-effect=’non-scaling-stroke’ stroke attributes. improved default Pen for dash-frame selection handles style. Dashed frames should now be visible on both the default white background and custom darker backgrounds. If you have questions or run into problems using the components you can use the Diagramming components forum, the help desk or write us at support@mindfusion.eu. Our support team will be pleased to help you. 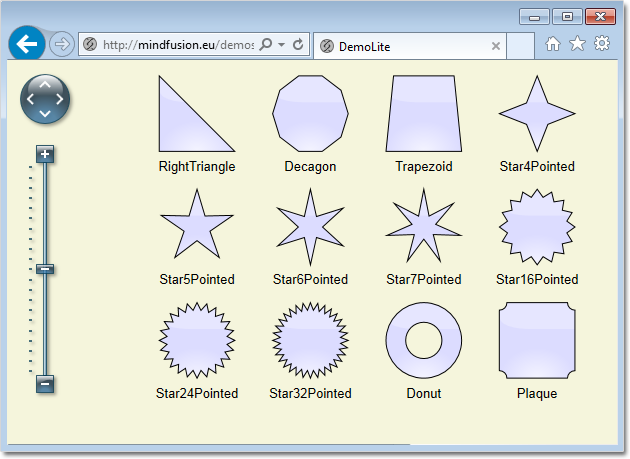 About MindFusion.Diagramming for WinForms: A programming component that provides any WinForms application with a full set of features for creating and customizing all types of diagrams, flowcharts, schemes, hierarchies, trees, graphs etc. The control provides numerous ways to save and load a diagram, six auxiliary controls and more than 10 automatic graph layout algorithms. Diagram elements include scrollable tables, container nodes, multi-segment arrows, custom diagram item types and many more. Further details here. About MindFusion.Diagramming for Wpf: Designed and developed to be easy to integrate, use, and customize, this native WPF flowchart component places at your disposal every single feature you would ever need to create diagrams, graphs, schemes, org charts, DB relationships, genealogy trees, class hierarchies and many more. Its long list of style options gives you complete control over the appearance of the diagram. 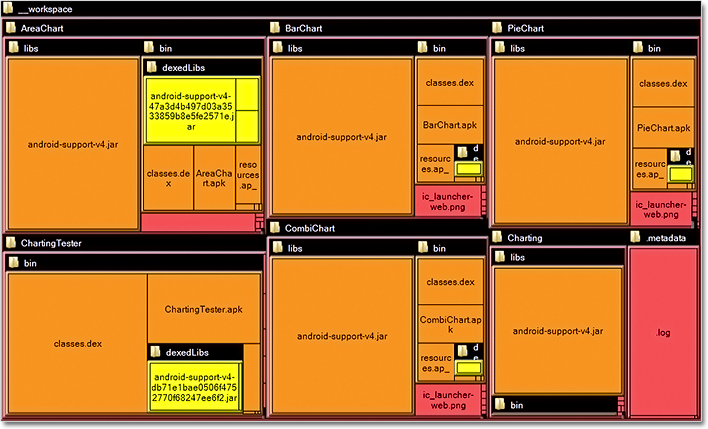 With a set of eight automatic layouts you are sure to find the arrangement that suits perfectly your WPF application. The diagram control boasts a long list of events, properties and methods for user interaction, item creation, data input and output. You can read the full features list here. The online demo shows samples that demonstrate various capabilities of the control. The licensing scheme and prices are uploaded at the buy page. Source code is also available. We have gratly improved the general text rendering quality. The components now remove scale transformations applied for MeasureUnit and ZoomFactor before drawing text on the canvas, and instead specify a scaled font size, which helps improve text appearance in Firefox and older versions of Chrome. You can draw the items’ text underlined. To enable this, set the underline attribute of the Font class. Font styles can be specified via Style instance by setting its FontStyle property. MindFusion no longer provides separate trial and licensed versions of its components. Instead, you should set the LicenseKey property to disable a component’s evaluation mode and stop displaying trial messages. If your application has more than one Diagram instance or other controls by MindFusion, a single call to MindFusion.Licensing.LicenseManager.AddLicense(key) is enough to specify the key for all the controls. You can find your license key strings listed on the Keys & Downloads page at your http://clientsarea.eu account. You can draw items using dashed lines in browsers that support the setLineDash function. To enable this, set the Pen.DashStyle property of DiagramItem or the StrokeDashStyle property of Style. to arrange assistant nodes in a separate branch between the main node levels. Specify if separate connected components of a graph should be arranged horizontally or vertically relatively to each other by setting the multipleGraphsPlacement attribute of layout classes. The type of LinkLabel.Margin property has been changed from number to Thickness, letting you specify different margin sizes at each side of the label. Masters for Start and Arrow7 shapes are added to VisioExporter template file. VisioImporter now tries to preserve ShapeNode.Shape when importing from files created by VisioExporter. MindFusion support team is happy to assist you with any questions you might have about Diagramming for ASP.NET MVC, Diagramming for ASP.NET or any other of our products. You can leave a message at the discussion board, use the help desk or e-mail support@mindfusion.eu.. We strive to provide competent and detailed answers to your questions within hours of receiving them. About Diagramming for ASP.NET Component: An advanced WebForms programming component that offers all the functionality that is needed for creating, styling and presenting attractive flowcharts, hierarchies, trees, graphs, schemes, diagrams and many more. The control offers numerous utility methods, path finding and cycle detection, rich event set and many useful user interaction features like tool tips, multiple selection, copy/paste to/from Windows clipboard and many more. NetDiagram offers over 100 predefined node shapes, scrollable tables, 13 automatic layouts and many more. 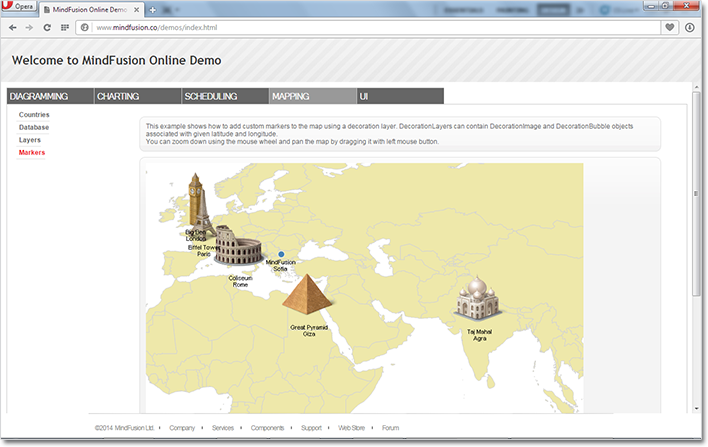 You can check the online demo to see some of the features in action. The control includes many samples, detailed documentation and step-by-step tutorials. Every features is duly documented and there’s plenty of code to copy. The component is not only powerful and scalable, but easy to learn and fun to use. MvcDiagram also supports various automatic layout algorithms that will make every diagram easy to understand and nice to look at. The diagram can also be easily serialized in binary or XML format. Exporting is done in a variety of formats including Pdf, Svg, Visio and more. 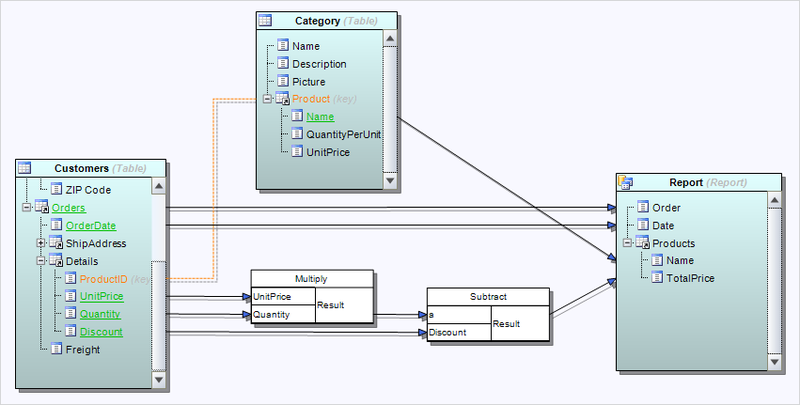 You can read details about the components at the MvcDiagram features page. MindFusion no longer supports separate trial and licensed build-s for its components. Instead, you should call MindFusion.Licensing.LicenseManager.AddLicense(yourLicenseKey) from within your application to stop displaying trial labels. The license key is listed at the Keys&Downloads page in your client account. Bars in the charting control can be sorted from within each series/cluster in ascending or descending order. You can also sort the series/clusters – by the sum of their values or the max value. If you set SortColor, the bar brushes and pens will be sorted along the bars as well. Bars are now outlined with the consecutive pen from the ChartPens collection rather than the AxisPen. Drawing of line and area charts has greatly been improved – the control now draws only the visible portion of the chart rather than the whole chart, which was clipped to the visible rectangle. AreaOpacity property added to radar charts. AxesOnTop property in radar charts sets the order of drawing for the graphic and the axes. The diagramming control has a new MapNode class that represents nodes that can render geographical maps. Currently map nodes can display the content of Esri shapefile files. Tree maps represent hierarchies by nesting child nodes within their parents, where the areas of leaf nodes are proportional to their Weight values. Unlike other layout algorithms, TreeMapLayout expects hierarchies to be defined via grouping or containment (see AttachTo method and ContainerNode class), and will ignore any links in the diagram. The DecisionLayout arranges simple flowcharts consisting of decision boxes with up to three outgoing links per node and activity boxes with a single outgoing link per node. The nodes are arranged in columns and rows, whose distance depends on the HorizontalPadding and VerticalPadding property values. and many more… read a full list here. You can now group rows and columns. To group or ungroup a range of rows or columns, use the Group or Ungroup methods of the RowRange and ColumnRange classes. The spreadsheet control can now import, display and export texts with mixed formatting. Formatted texts can also be created programmatically by assigning a FormattedText instance to the Data property of cells. Trat yourself to the new Excel-like editing features that are now part of the spreadsheet component. When you type a new formula pressing the arrow keys will result in navigation within the worksheet (instead of adjusting the caret position) and the selected cell or cell ranges will be inserted as a reference in the currently edited formula. Header interaction notification events – ColumnsMoved, ColumnsResized, RowsMoved, and RowsResized. Group interaction events – ColumnGroupCollapsed, ColumnGroupExpanded, ColumnOutlineLevelToggled, RowGroupCollapsed, RowGroupExpanded, and RowOutlineLevelToggled. Custom drawing events – DrawColumn and DrawRow. The core calculation engine of the spreadsheet control now offers 22 new functions, including a full set of database functions, such as DGET, DSUM, and so on. The Function Reference section in the online help offers further details. Worksheets can be moved and copied to another workbook through the new Move and Copy methods. The new EnableFormulaEvaluation property can be used to disable formula evaluation across the workbook. New ShowActiveCell and ShowSelection properties added to the WorkbookView and WorksheetView classes. You can use the ZoomControl class to let users change interactively the current zoom level and scroll position of a DiagramView. 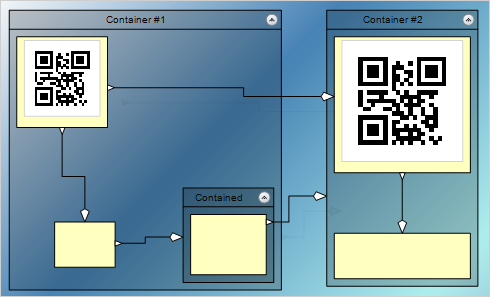 First, add a ZoomControl element to the page and set the control’s TargetId property to the id of a DiagramView. Then set the ZoomStep and ScrollStep properties to specify the amount added to diagram’s zoom level or scroll position by ZoomControl’s buttons. You can customize the control’s appearance by setting properties such as Fill, BorderColor, CornerRadius and TickPosition. Note: The Zoom control is not available in JavaApplet mode in Diagramming for ASP.NET. The Diagram.ShadowsStyle property and ShadowsStyle enumeration let you switch shadow rendering order between rendering all shadows in a single background layer (OneLevel) and drawing each shadow close to its node, possibly overlapping other nodes (ZOrder). ShadowsStyle.None lets you disable shadows altogether. Set the LinkLabel.Brush property to fill the background of link labels. Number of link segments can now be set by calling the DiagramLink.setSegmentCount() method. The BackgroundImageAlign property specifies the alignment of diagram’s BackgroundImage. The TextPadding property specifies the padding distance between the borders of a node and its text. Nodes of all classes can be rotated. The ZoomControl class lets users change interactively the current zoom level and scroll position of a DiagramView. It’s very easy to set up a ZoomControl – just add the element to the page and set the control’s TargetId property to the id of a DiagramView. You can customize the control with the ZoomStep and ScrollStep properties. They let you specify how the diagram’s zoom level or scroll position are changed by the ZoomControl’s buttons. You can further customize the control’s appearance by setting properties such as Fill, BorderColor, CornerRadius and TickPosition. The ShadowsStyle property is now supported in Canvas mode. You can set the number of link segments from the client-side scripts by calling the setSegmentCount method. The BackgroundImageAlign property is now supported in Canvas mode. The TextPadding property of items is now supported in Canvas mode. Arrowheads are rendered as a single path when possible and several arrowhead Shape definitions have been changed to implement mitered joints when HeadPen is set to a thick pen. You can specify the point where end segments connect to arrowheads via the LinkSegmentInset property of shapes. Arrowhead shadows are no longer filled if the link’s EffectiveBrush is null or fully transparent. VisioExporter export speed has been improved greatly for large diagrams. Multiple-resize of rotated nodes fixed to apply same offsets in nodes’ local coordinate system. The Brush property of LinkLabel class lets you set background color for link labels. set decorative elements like images, icons etc. Map data can be loaded from the popular ESRI Shapefile format and you have at your disposal an impressive variety of *.shp files, which give you valuable data for any country in the world as well for selected cities, rivers, roads and other geographic objects. Data for the attributes of map elements can be loaded from a DBF file associated with each map. The control supports multiple layers so you can show several maps in a single view. The new Slider control represents a range slider, which can be used to specify a numeric value constrained between a minimum and maximum. A UI demo with the slider control. Rows and columns can now be grouped. You can group or ungroup a range of rows or columns with the Group or Ungroup methods of the RowRange and ColumnRange classes. You can set the outline level of a row/column or a range of rows/columns directly with the OutlineLevel property. Groups can be expanded and collapsed interactively, by clicking on the expand/collapse button in the view, or programmatically, by settings the IsCollapsed property of the respective row or column. Grouping rows and columns in the spreadsheet. You can now move and copy spreadsheets to another workbook through the new Move and Copy methods. Use the new EnableFormulaEvaluation property to disable formula evaluation across the workbook. New ShowActiveCell and ShowSelection properties are added to the WorkbookView and WorksheetView classes. If you require technical support, you can post a message at the forum, send us an e-mail at support@mindfusion.eu. or use the help desk. MindFusion takes special effort in providing fast and detailed answers to all inquiries that we receive. About MindFusion.Spreadsheet for WinForms: An easy-to-use programming component suitable for building all types of spreadsheets fast and easy. The tool supports formulas, tool-tips, cell annotations, cell spanning, scrolling and many more. 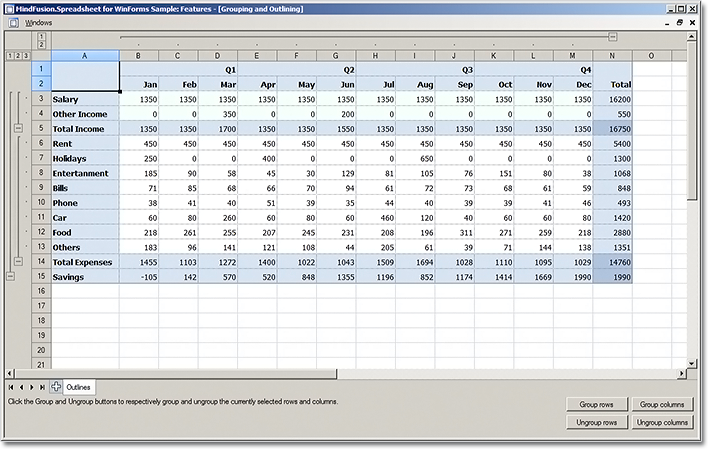 You can add charts and images as well use the flexible style system to design the perfect spreadsheet. The component supports full undo and redo as well copy and paste from Windows clipboard. You can import spreadsheet data from CSV, XLSX or ODS files and export the final spreadsheet in a number of formats – as images, PDF or CSV, XLSX or ODS files. 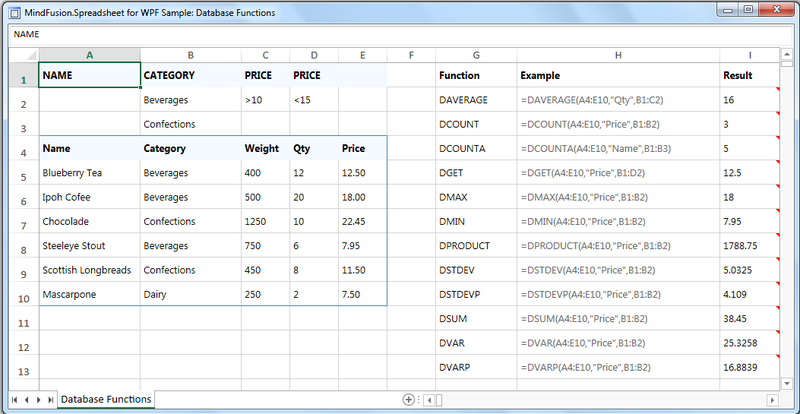 Various auxiliary forms help you quickly adjust the data and appearance of your spreadsheet. Read more about the features of the component here or check the license prices at the buy page. Spreadsheet for WinForms is part of MindFusion Pack for WinForms, which offers other useful components that are of great use when you build any type of WinForms application – from a diagramming library to map control to gauges: check them here. 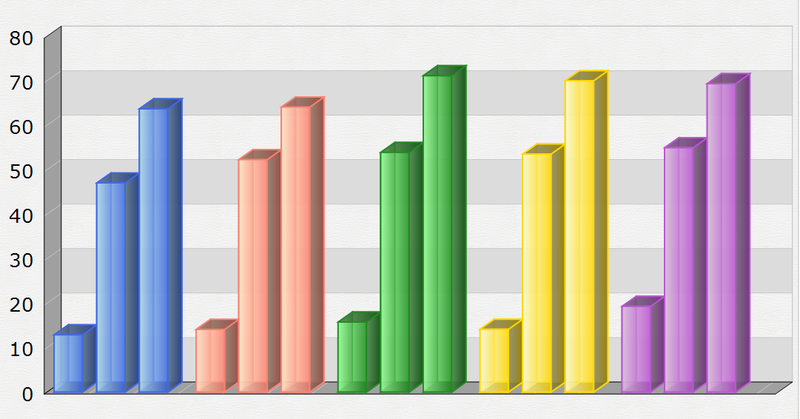 Drag the RealTimeChart from the toolbox or add a reference to the MindFusion.RealTimeCharting.Wpf assembly. The chart has no initial data so we start with a simple X-axis on the screen. We name our chart “rtChart”. The X-axis is accessible via the rtChart.XAxis property. It exposes many appearance settings, from which we start with Interval, Length and Origin – they will define our axis. When data accumulates, the initial axis labels shall be replaced with their updated values. It’s worth noting that we don’t pin labels e.g. they will move along the axis as new data is added. We need no trailing zeros, so the LabelFormat is “0”. There is no limit on how many Y-axis we will create. In our sample we will use two: one at each side of the chart plot area. We need two instances of the Axis class, which we add to YAxisCollection and Y2AxisCollection respectively. Before we add them, we set their appearance. We want tick marks and rotated title. Note that we align the second axis (Y2) to the right. We need four series – two of them will be bound to Y and two – to Y2. It’s important to note that axes must be initialized before the series, because each series is associated with a given Y-axis when created. Don’t forget to call the Commit() method in one of its overloads – it signals to the chart that new data has been added and refresh is needed. We want a legend and we turn on ShowLegend. The initial result is a legend in 4 rows, which does not look beautifully on our chart. We plat for a while with LegendWidth and LegendHeight and come up with a satisfactory outlook for our legend – in two columns, centered below the plot area. 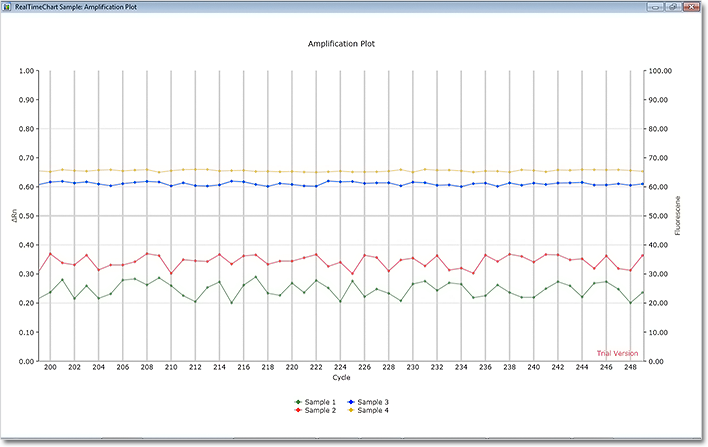 Real-time chart: amplification plot sample. MindFusion.RealTimeCharting for WPF is part of MindFusion.Charting for WPF component, which also includes MindFusion.Gauges for WPF. 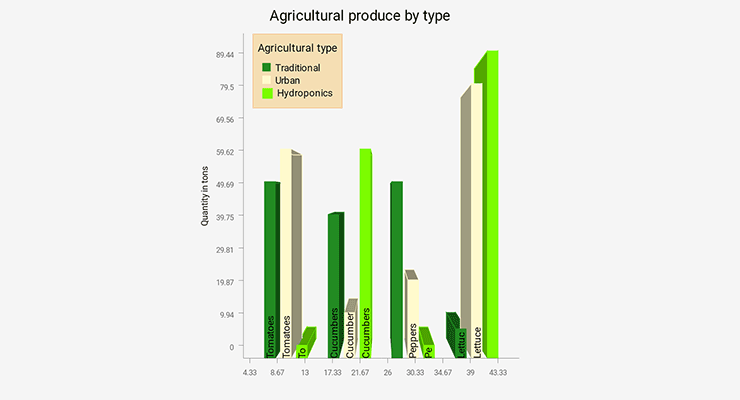 Check the trial version for more practical, beautiful and easy to build charts and gauges. About MindFusion.RealTimeCharting for WPF: A WPF programming component, which has been designed and developed to render real-time charts with huge amounts of data in a fast and efficient manner. 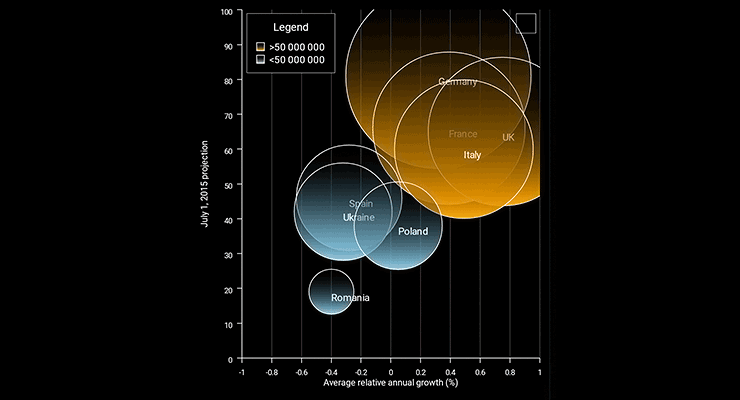 The component uses innovative approach to draw the chart graphics, which forgoes the traditional constructing of a tree with the visual elements in WPF. This way CPU load remains minimal and graphics of tens of thousands of points are rendered with impressive speed. The tool supports unlimited number of Y and Y2 axes, legend, tooltip, background image, grid and more. About MindFusion.Charting for Wpf: A programming component that combines powerful charting capabilities with an elegant API and easy use. Among the features of the control are fully customizable grid, positive and negative values on all chart axes, 3D charts, gauges and many more – read a detailed list here. The control provides detailed documentation and various samples that demonstrate how to customize every type of chart. It supports a wide range of 2D and 3D charts including bar, line, radar, bubble pie etc. You can add tooltips, define themes, perform hit testing, zoom and more. Arrowhead rendering has been improved as you can see in following new vs. old version image. arrowheads are rendered as a single path when possible and several arrowhead Shape definitions has been changed to implement mitered joints when HeadPen is set to a thick pen. the point where end segments connect to arrowheads can be specified via the Shape.LinkSegmentInset property. 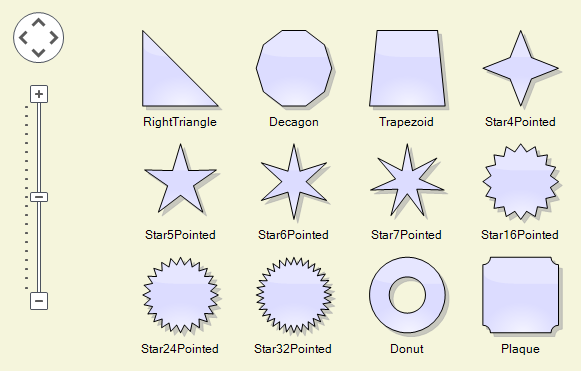 Shape definitions from the Arrowheads class set it to suitable default value. This allows using transparent or semi-transparent brushes without seeing the link line drawn behind arrowheads. For consistence with MindFusion libraries for other platforms, BackBrush in default diagram style has been changed to white brush. Fixed KeepInsideParent constraint for rotated parent nodes. If you have questions or run into problems using the component you can use the Diagramming for WinForms forum, the help desk or write us at support@mindfusion.eu. Our support team will be pleased to help you.